We created this website for Environmental Studies 220: Cultural and Natural History of the Adirondack Park at Hamilton College in Clinton, NY. We conducted research on the III Olympic Winter Games held in Lake Placid in 1932 with emphasis on preparations for the event. We became interested in the 1932 Olympics after visiting the Lake Placid and touring the Olympic facilities--the buildings from the 1980 games continue to dominate the town and draw tourists but the impact of the 1932 games is less apparent. 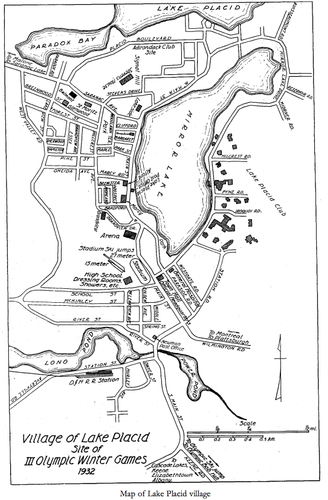 In our course we studied the history of land-use in the region that would become the Adirondack Park in 1892. We looked at the stories of the earliest homesteaders who struggled to farm for subsistence given the short growing season and poor soil. We studied the history of logging, from small-scale manual logging to the mechanized clear-cutting of trees in the late 19th century. We studied the rationales for legal protection of state lands and the legislative steps taken to ensure that the Forest Preserve lands remain "forever wild" for the foreseeable future. If you’re interested in the specifics of the events--like what was served at the second feed station during the 50 km cross-country ski race--this report is an outstanding and thorough resource. However, our objective here is to provide an overview of how the unique arrangement of public and private land in the Park shaped land-use debates concerning the development of infrastructure for the 1932 Olympics.